September is Disaster Preparedness Month! Disaster preparation is not something we like to think about, but with Mother Nature dealing out some of her most bizarre hands in recent memory it’s better to be safe than sorry! The following is a list of disaster preparation tips compiled by the ASPCA and the Humane Society of the United States. START GETTING READY NOW! Make sure all your furry companions have collars and identification tags that include your contact number. Most dogs wear their collars and tags full time, but cats, and particularly those who stay indoors, may not wear their collars or even have tags. And though pets with microchips are more likely to be reunited with their family, the average good Samaritan won’t be able to scan for a chip but they will be able to read a basic tag with a name and phone number! There are tags available now which slide onto the collars so they don’t contribute to the “jingle” noise which can spooks cats in particular. 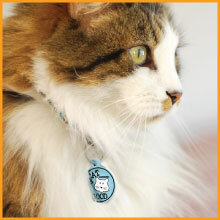 A cat harness instead of a collar is also a good option for using this style tag. These tags can hold more information than just your pet’s name. Your name and phone number should also be included, and if there’s room for your vet’s name include that too. FIND A SAFE PLACE TO STAY IN ADVANCE! Contact hotels and motels outside your area to find out which ones accept guests with pets, and if there are any restrictions. Keep a list of the animal-friendly places handy, and make reservations ahead if at all possible. Call friends or relatives who live outside your immediate area to find out if they would be willing and able to shelter you and your pets. If you have multiple pets you may need to make arrangements to shelter them at separate locations. IF YOU EVACUATE, TAKE YOUR PETS! If it isn’t safe for you it isn’t safe for your pets. Pets left behind in a disaster are frequently lost forever, injured or killed! Some companies have emergency readiness kits already prepared, like the ones sold by PetHub. Use coupon code “PREPARE” for 20% off one of their ReadyKits! IF YOU SHELTER AT HOME, DO IT SAFELY! Block up or close off any nooks and crannies where frightened pets may try to run and hide. If you have a room or basement area designated as your “safe room” put your emergency supply kits there in advance. Keep a radio handy so you know when it’s safe to come out. AFTER THE DISASTER, TAKE IT EASY! Your home may be a very different place after an emergency, and as hard as it is for you it will also be hard for pets to adjust. Don’t allow them to roam free until you have thoroughly checked things out for safety. If flooding has occurred check for displaced wildlife in the area around your house. They could pose a threat to both you and your pets. Call a trained expert to have wild animals safely and humanely removed and relocated. BE PREPARED FOR EVEN SMALL EMERGENCIES! A traffic accident may strand you on the road home from work for hours, or worse yet if you’re one of the parties involved you may need to be taken to the hospital. Plan ahead for a trusted friend, neighbor or family member to have a way to enter your home to care for your pets in case of a sudden short-term emergency. Hopefully, these small steps can make a huge difference in your life and the lives of your pets in an emergency situation and will help you recover and more quickly to return to normal. Very informative and interesting article. Many people certainly haven’t planned for their pets and this is certainly an eye-opener. Pets are the family many people don’t have and their well-being is close to the hearts of millions of pet-owners. I wish you all the best for the future . Thank you for taking the time to stop by and read my article. I appreciate your kind words. I am always heartbroken to see the animals left behind in a disaster. They are the most helpless members of our family and depend on us to keep them safe. Good luck with your own preparation plans, whether they include pets or not.